The monsoon is here. Are rattlesnakes more active? After months of brutally hot and dry conditions, the valley was absolutely hammered with rain and wind last night. The longer a person lives in Arizona, the more they learn to love such events. This is certainly true for native Arizonans, including rattlesnakes. As humidity increases, rattlesnakes that have been hiding deep under cover have been emerging in small groups at the entrance of these safe areas, hoping for some rain. When the first sprinkles do come falling down, the rattlesnakes coil and gather rain on their scales, then drink it from any surface they can. While most of us were swearing in traffic or huddled at the office window watching palm leaves fly through the air, rattlesnakes all across the valley were sitting out in the open waiting for their first drink in awhile. The long wait is finally over – another foresummer survived. To quickly address what you may be hearing out there: yes, monsoon weather does increase rattlesnake activity. So what is next in the life of a rattlesnake? Does the monsoon make them more active? In short, yes. Though rattlesnakes are active all year to varying degrees, the monsoon moisture brings the greatest period of activity of all. In just a few short months, they need to shed their skin (at least once), eat, mate, have babies, eat again, mate, establish dominance over new areas, travel to birthing, shedding, and hunting areas, and more. They are very active and this means that they can show up in surprising places more than other times in the year. It’s not just the moisture and a chance to drink that brings them out – temperature is a primary driving force that dictates most rattlesnake activity. When the rain finally comes, the temperature stabilizes into a much more survivable, and predicable, range of temperatures. Daytime temperatures drop, nighttime temperatures stay put, and overcast skies can mean a longer, slower climb into lethal temperatures each day. This makes heading out into the world in search of mates or food a much less dangerous activity, and rattlesnakes begin to cover ground much more than in previous weeks. Under the darkness of a new moon in the monsoon humidity, rattlesnakes can be found moving in great numbers everywhere in Arizona. This may not mean that people are more likely to run into them. Unlike the active period in the Spring, much of their activity takes place at night. That means that while they may be more active than any other time during the year, much of the contact time that can overlap with human behavior takes place right at sunup and shortly after. That means that we will get a few relocation calls each day from people surprised by a rattlesnake sleeping by the front door as they leave for work, but much of the rest of the day is pretty quiet. that is, until the babies start to move. 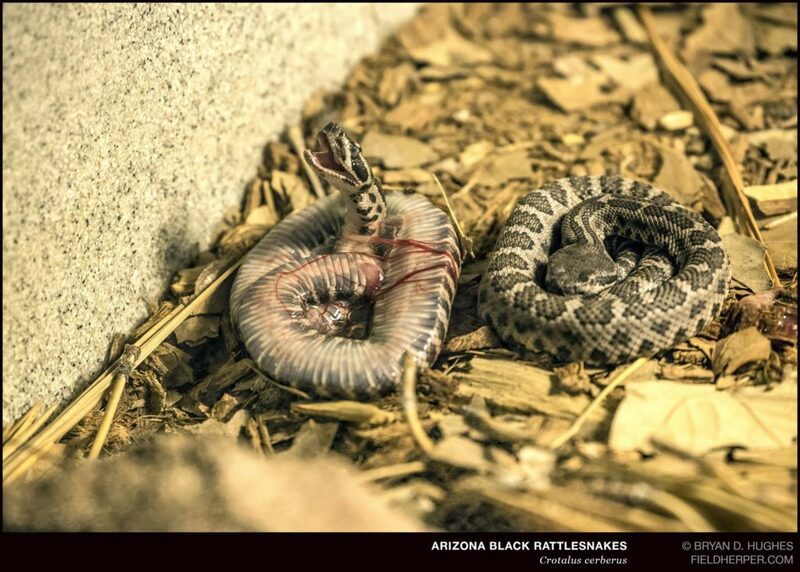 What happens when baby rattlesnakes are born? Starting in mid July (now), some rattlesnakes begin to give birth. Rattlesnakes give live birth and do not lay eggs, and will stay with their babies for a period of time afterward. Once the baby rattlesnakes have shed their skin, they head out into the big scary world to eat and figure out how to be a rattlesnake. As they wander, they often get into a lot of trouble. We find baby rattlesnakes in all kinds of terrible situations – stuck in glue traps, squished all over roadways, and crawling around in conditions that no self-respecting adult rattlesnake would ever be caught out in. This is bad news for home owners near areas where rattlesnakes live, since the likelihood of random encounters may be higher. However, unlike what is often the case with larger and older rattlesnakes, a visit from a newborn rattlesnake may not be for any particular reason but close proximity to desert areas, and may not actually indicate a rattlesnake “problem”. What can be done to avoid rattlesnakes during monsoon season? Even when rattlesnake activity is at its peak, the usual rules apply: stay aware, avoid putting hands and feet into places you can’t see, and keep the yard clean. If your backyard looks anything like mine does right now after last night’s massive storm, debris and leaf litter can be all over and be used as cover for rattlesnakes. Do what you can to keep debris to a minimum, rodent populations in check, and assume that any dark place has a rattlesnake in it until proven otherwise. If you live near an area where you may have random rattlesnake traffic, now would be a good time to pull the trigger on getting a rattlesnake fence installed, before the babies come. If you do have a rattlesnake fence already, use the pen test to see if your fence is good enough to really do the job. Even though rattlesnakes are pretty much having a party right now, it doesn’t mean you need to worry too much. Just stay aware, and enjoy the rain! Living with Snakes Basics for New Arizona Residents	Bullsnake or Gophersnake – What’s the difference? If you’re in Arizona, you may be surprised.